This rust-coloured copper home extension by British studio Poulsom Middlehurst sits above the red-brick walls and clay-tiled roof of a Victorian terrace in east London. Poulsom Middlehurst extended and refurbished the top floor flat inside a Victorian property in Clapton, east London. The one-bedroom flat had previously been spread over two floors, with an uninhabitable attic space usable only for storage. The extension takes the form of a large dormer – a structure that projects horizontally out from a roof. It creates an extra bedroom and bathroom on the upper level, while a new staircase provides better access to an existing roof terrace. The russet copper cladding of the loft extension pairs with the red brickwork of the period property, but will eventually oxidise to harmonise with the green foliage of neighbouring tree branches. "The exterior copper cladding will change colour as it is weathered over time," said the architects. "The colour has already changed to deep orange and will eventually become green to match the surrounding trees." 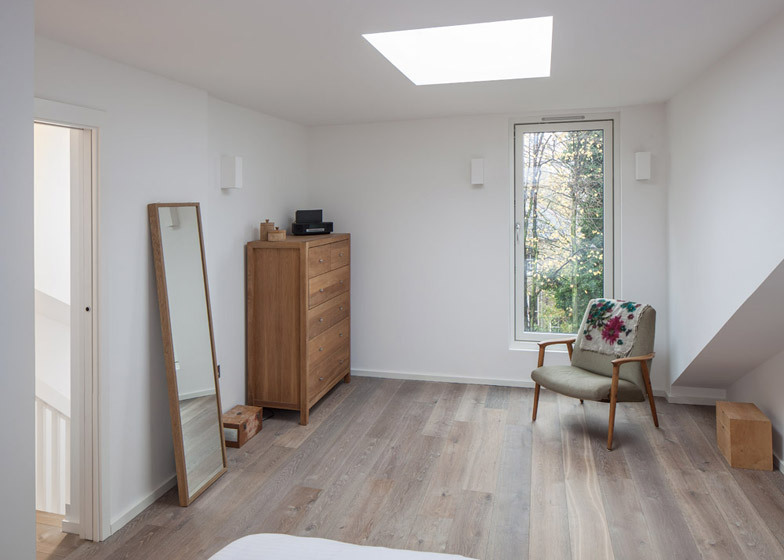 Inside, the south-east London architects removed a cumbersome chimney breast to maximise the limited floor plan, and added large windows and skylights to bring more light into the various rooms. "Large windows, glass balustrades and roof lights give the space an airy and lofty feel, providing numerous new vistas and views to the surrounding trees and sky," said the architects. Earthy accents of colour come in the form of engineered timber floorboards, grey slate paving across the roof terrace, and dark grey and brown hexagonal tiles in the bathrooms. The new staircase features L-shaped wooden treads. "A new stair acts as a spine, which knits together the new and old aspects of the property to create a single, coherent set of spaces," added the architects. A wide glass door leads off a midpoint landing to the roof terrace, where a large skylight for the kitchen is set into grey slate paving. From here, the staircase continues up to the master bedroom and bathroom. It is lit by tall windows, skylights and a series of small rectilinear light fittings that project light upwards and downwards. Large expanses of mirror in the lower and upper floor bathrooms reflect the light from clerestory windows and skylights. "An enlarged fixed window opens up impressive views from the bathroom and landing to the trees at the rear of the house," said the team. The floors are covered in small hexagonal tiles with white grouting, while walls have white rectangular tiles with dark grouting. Photography is by Andy Spain.